A Man Worth Voting For. FORMER FijiFirst party Cabinet minister Pio Tikoduadua said he joined the National Federation Party (NFP) to ensure a brighter future for his children and for the country. While addressing a gathering at Rakiraki Village yesterday, he said the future of the country and especially that of the youths was at stake. This had prompted him to come out of retirement and to enter national politics. “I am happy to be at the front and I am happy to cop the bullet,” he said. “That is the risk, I take but it is a risk that is actually worth taking. Because, I am not taking it for anyone else, I am taking it for my son and my daughter. “That’s my motivation. Because if I don’t, they are going to go through worse. So don’t let your children go through worse, they have been through enough. Cancer researchers in Europe analysed blood from 265 men with the disease. They found those with multiple copies of a particular gene did not respond to abiraterone and enzalutamide – drugs commonly used to treat advanced cases. More trials are needed but the team hope the test could prevent thousands of men undergoing unnecessary treatment and allow more personalised care. The drugs abiraterone and enzalutamide are given to men whose cancer is no longer responding to traditional hormone therapy and has started to spread. Costing less than £50, the test is a quick and relatively cheap way of preventing men from undergoing the side effects of therapy that will fail. Very Uneasy Lies the Head That Wears the Crown. SPEAKER of Parliament Dr Jiko Luveni says “there is no law currently that prevents people from criticising parliamentarians”. Responding to questions regarding the Parliamentary Powers and Privileges Bill 2016 (Bill No.28 of 2016), Dr Luveni said the Bill was before the Parliamentary Standing Committee on Justice, Law and Human Rights which had already called for public submissions. Under clause 24 of the Bill, any person whose words or actions defames, demean or undermine the sanctity of Parliament, the Speaker or a committee commits an offence and is liable upon conviction to a fine not exceeding $30,000 or to imprisonment for a term not exceeding five years or to both, and in the case of a body corporate, to a fine not exceeding $100,000 or to imprisonment for each director and manager for a term not exceeding five years, or to both. Dr Luveni said people were encouraged to air their views on the Bill to the committee as hearings were open to the public. “The deadline for written submissions is 15th May 2017 and this week beginning tomorrow (today), the committee will be holding oral submissions. She said there were laws in place that protected the freedom of speech in Parliament and protected people and witnesses who made submissions or appear before parliamentary committees. Yesterday, prominent Suva lawyer Richard Naidu of Munro Leys said it was unthinkable in any democracy that there should be a law which prevented people from criticising Parliament. “This violates their (people’s) freedom of expression and their right to demand accountability from their MPs,” Mr Naidu said. He said clause 24 of the Bill made it a crime to “defame, demean or undermine the sanctity of Parliament, the Speaker or a committee”. “This is so vaguely worded that a person could be prosecuted for saying virtually anything about Parliament. Mr Naidu said the word “sanctity” did not even exist in most legal dictionaries. “It means being holy, sacred or saintly. Parliament is not holy, sacred or saintly. It is a place where ordinary people, elected by other ordinary people, engage in debate and pass laws. “The same people can also make mistakes, behave badly and waste the money that taxpayers pay to keep them there. He said under the Bill, it was bad enough that a ordinary person could go to prison for five years for breaching the law. “But if a company manager criticised Parliament for passing a law he or she did not like, all of the directors and managers of that company could also go to prison for five years, even if they knew nothing of what their manager had said. “So the whole of clause 24 is characterised by overkill and paranoia. 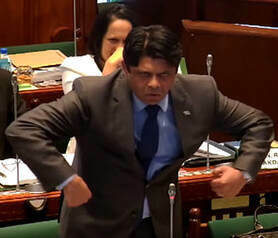 Yesterday, the National Federation Party said they would repeal the Parliamentary Power and Privileges Bill – which is Bill 28 of 2016, if it forms a Government. In a statement, party leader Professor Biman Prasad said clause 24 of the Bill would allow Parliament to jail and fine people if they “defame, demean or undermine the sanctity of Parliament”. “It goes without saying that we oppose it. An NFP government will ensure clause 24 of the Parliamentary Privileges Bill will never see the light of day,” Prof Prasad said. “Parliamentarians are the people’s servants. The people elect them and the people pay them. Prof Prasad said freedom of expression is also the freedom to differ with the Government. He said there was no democratic country in the world where such a law existed. He says they only had source documents till 2006. Prime Minister Voreqe Bainimarama (right) and his Australian counterpart Malcolm Turnbull. 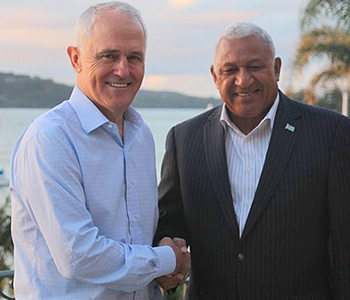 The Australian assistance for Fiji’s COP23 presidency has been the subject of talks in Sydney between the Prime Minister Voreqe Bainimarama and his Australian counterpart Malcolm Turnbull. The Prime Minister is in Australia for a four day visit and left soon after arriving to meet Turnbull at his home in Sydney’s eastern suburbs. Bainimarama told Turnbull that it was critical to preserve the multilateral consensus contained in the Paris Agreement for decisive cuts in carbon emissions to arrest the current rate of global warming and reduce the impacts of climate change, including extreme weather events such as Tropical Cyclone Winston. He says Fiji had deeply appreciated Australian assistance in the wake of the devastation caused by Winston last February. The PM also asked Turnbull to use his influence with countries like New Zealand and Japan to fully support Fiji’s leadership of the ongoing UN climate change negotiations in Bonn, Germany, in November. During his visit to Australia, the Prime Minister will deliver the keynote address at the 4th Australasian Emissions Reduction Summit in Melbourne today. How About some action at Home Frank…. This type of fuel oil can be made from high sulphur Middle Eastern Crude in which case the fuel oil will have a high sulphur content which will necessitate using more expensive lubricating oil in the engines and also doing something to scrub the exhaust gases so that you don’t just put nasty oxides of sulphur up the chimneys, which will give children and adults living in the area of the power station asthma and respiration problems, over time it also corrodes everything made of steel. It has a high specific gravity and might be borderline in terms of whether or not it floats. ( which means it is extremely dangerous to marine life in the event of a pipe leak or accidental discharge). It could be made from low sulphur South East Asian Crudes – like Tapis for example. In that case it will not have such a high sulphur content but it will be waxy which means that it will be solid or semi solid at ambient temperatures (high pour point) and will certainly need heating for storage and handling. In short it is a low cost product with disadvantages that Fiji really does not need. However guess what?? ?, contractors are currently installing the new pipeline to handle this product, and we are advised two new fuel storage tanks are to be built at Vuda. Have the public, or the residents of Vuda, the investors in hotels and developments in the area been advised or consulted??. Not to my knowledge. It is rumoured that the local land owners have been paid a pittance to obtain their approval for an additional pipeline, but were they fully informed about its proposed use. Has our erstwhile PM, whilst campaigning against air and ocean pollution been kept advised. Has he advised his peers on the world stage that Fiji is facilitating and encouraging the use of this product, in one of Fiji’s main tourist areas.??? One thing is certain, trust has been shattered and nothing can mend it.